Pictures provided by Patrick Hauser (hauserpatrick@gmx.net) and Marco Schwaab (Marco.Schwaab@t-online.de). After the Atlanta Flames failed to establish themselves in Atlanta, Georgia between 1972 and 1980, the team moved to the canadian city of Calgary, Alberta, prior to the 81-82 season. At that time nobody was able to imagine that only 15 years later teams from Quebec and Winnipeg would move to the south of the US and away from their traditional roots with the same motives. Even Atlanta returned to the NHL with the Atlanta Thrashers, an expasion team owned by Ted Turner, in 1999, and the first meeting between the former Atlanta-team and the new Atlanta-team went in favor of the Thrashers, who did not win a lot more games during their inaugural season. It remains questionable if the Calgary Flames will be able to survive in today´s NHL with it´s escalating payrolls and the low value of the canadien dollar compared to the US currency. It would be a sad move if Calgary or any of the other few remaining canadien teams would have to move to the US out of economic reasons, too, but there is hope that the canadien government might help those franchises in need out and that the NHL increases it´s financial help in order to keep the canadien teams afloat (the NHL subsidizes canadien franchises that manage to sell a certain amount of season-tickets in order to make up the difference between the canadien and us-currency). After sluggish attendance-figures during the last couple of seasons the "Flames Forever" campaign during the summer of 2000 NHL-fans in Calgary renewed their support for the team and the number of season tickets rose from a number below 10.000 to more than 14.000, but it is questionable wether the Flames will be able to shake up the city year after year with some save-the-flames-campaing. At the moment the Flames are in their 20th season in Calgary, a time-span highlighet by the Stanley Cup in 1989. For 18 years, since the 15th of October 1983 to be exact, the Flames play their home games at the Saddledome, an arena that belongs to the smaller ones in the NHL with a seating capacity of 17.104 that was build as a permanent home for the NHL-franchise and for the Olymic Winter games. The Calgary Hitmen (Western Hockey League) share the arena with the NHL´s Calgary Flames, in addition to that the arena is used as most other modern arenas for concerts of conventions. Despite the fact that Canadiens are thought of as the hockey-craziest peope in the world one should not be too concerned about ticket-availability in Calgary. In 1999/2000 and before the ongoing save-the-flames-campaign the average attendance was about 15.000, a rather low number compared to most US-franchises. And with ticket-prices that average about 40 canadien dollars the Flames also come in as one of the lowest-prized teams in the NHL. The fact that the team was not able to remain a succesful franchise in the 2nd half of the 90s and the fact that a talent-drain due to the tight budget of the team is more a constant than the exception left many fans frustrated and resulted in thousands of cancelled season-tickets over the years. Even now with more than 14.000 season-tickets sold in Calgary a sellout is an exception, and the reality of the 90s is that ex-star-Flames such as Joe Niewendyk or Theoren Fleury hit the ice on Broadway or in Texas. Only games against local rivals such as the Edmonton Oilers draw big crowds and result in a sold out Saddledome, but if the team remains competitive there is always a chance that the choice of ticket at the game-day boxoffice might be limited so as long as the teams runs it´s ticket-campaigns it might be adviseable to order tickets in advance. The Saddledome in Calgary is also one of the few arenas of the NHL (only Nashville and the old Montreal Forum come to my mind) where smoking is still allowed in certain areas of the building, so if you can´t wait for a smoke during the game there is always a place to go, even though you will have to live with hockey on a tv-screen then. As I already mentioned ticket-prices are very fan-friendly in Calgary, you can enjoy hockey for as low as 15 canadien dollars while the top-tickets go for 100 dollars. Very good upper- or lower-level-tickets are available for 50-60 dollars, quiet a difference to Madison Square Garden for example where 60 us-dollars only buy you a seat halfway to the ice. If you want to inquire about tickets before your arrival in Calgary I would recommend a visit to Ticketmaster on the internet (link at the end of the article) or a quick call to the arena box-office (403-777-4630). 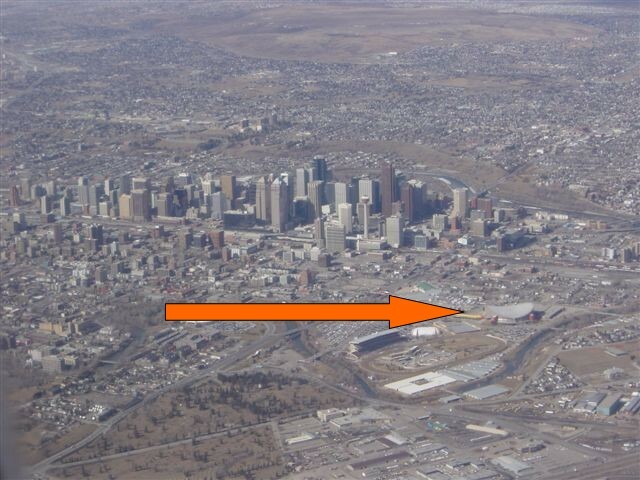 The arena is pretty close to downtown Calgary and easy to find. Just take the C-train to Victoria Park / Stempede and after a couple of meters on the Olympic Way you will find yourself right in front of the building. If you prefer to walk the whole distance you should be able to make it to the arena in 20-30 minutes from downtown Calgary, if you come by car you will find enough parking available at Stempede Park for 5 dollars.